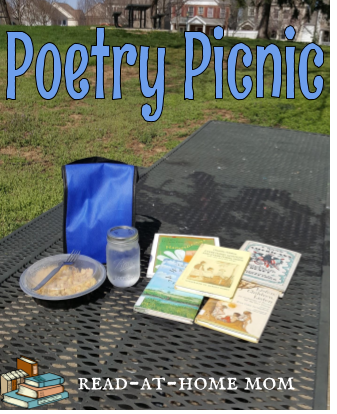 I looked outside last Wednesday morning and realized it was the perfect spring day to begin a new season of poetry picnics. At the end of the summer last year, Miss Muffet's behavior (mostly running away from me) made us put the picnics on hold for a while, but I'm glad we started up again because this one was just lovely. We ate pasta salad and cake, and I read the poems listed below between feeding bites to Bo Peep. My husband read a story about President Lincoln to Miss Muffet from My Bookhouse the night before the picnic, so I decided this would be an appropriate choice. I don't think she fully understood the poem, but she enjoyed hearing Lincoln's name again. A lot of Bodecker's poems are too sophisticated for a three-year-old, but this one, about asking a ladybug to fly up to God and ask him to bring out the sunshine, was very sweet. Miss Muffet was interested in the fact that ladybird is another word for ladybug. I like Florian's way of playing with language. These poems were not as punny as some of his others, but I thought they were a nice way to talk about spring. Miss Muffet especially liked it in the last poem when spring was called "daffodilly." We sing a version of this around the house a lot, so Miss Muffet recognized this poem right away. I include Stevenson a lot when we do these picnics because his poems are so appropriate for preschoolers. Miss Muffet had just been on a swing the day before the picnic, too, so she got a kick out of hearing this one. I remember this poem from childhood, so it jumped out at me when I was flipping through the book and I decided to add it to my list. I don't think Miss Muffet got what it was about, but the rhythm of it is very pleasing. Miss Muffet also remembered this one, and I'm sure that's because it's one of my favorites and I read it a lot. It always make me think of spring, even though the reference to raking leaves away makes the setting more likely to be Fall, which is also what the book's illustration suggests. Personally, I just love the line, "I shan't be gone long. You come too." Miss Muffet didn't like this poem as much as the others, but I read it mostly for me anyway. It's become a favorite in the past few years. I have always loved Charlotte Zolotow and I can't name too many other authors who wrote as succinctly and emotionally about everyday things. These two color poems appear side by side in this collection and they have almost identical structures, so it was nice to read them together. Miss Muffet had a big grin during both of these - especially the one about blue, which is one of her favorite colors.